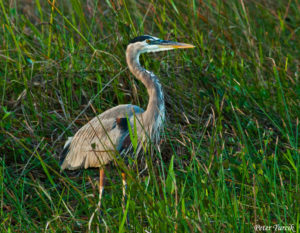 Chesapeake Conservancy and Explore.org are proud to bring you the Great Blue Heron Cam from Maryland’s Eastern Shore! We would like to thank the original donors to our GoFundMe campaign in 2016 including Waterfowl Chesapeake for getting this cam started! Like the Conservancy’s osprey and peregrine falcon cams, the great blue heron cam gives you an up close and personal look at the daily lives of an iconic species of the Chesapeake. Great Blue Heron cam takes you inside a great blue heron rookery (colony) located on Maryland’s Eastern Shore. The herons returned to their nest in early March and began reconstruction of their nests. Following reconstruction, the various heron nests began to lay eggs and incubate. Rell & Eddie, the stars of Nest 1 laid 5 eggs (Mar 31, Apr 3, Apr 5, Apr 7, and Apr 9). 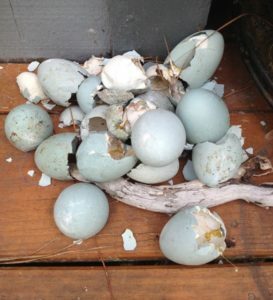 Unfortunately, three of the five eggs became damaged in an unknown manner and were disposed of on April 10. Nest 1 now has two remaining eggs which will be incubated with a pip watch beginning April 27. This year there are three main nests featured on the cam, a few more can be seen off in the distance. The main nest featured most clearly features “Rell & Eddie.” We call this nest #1. There are 10-12 nests total. Looking forward to a great season with the new sophisticated cam! Nest 1: Eggs laid Mar 28, Mar 30, Apr 1 and Apr 3. Hatched Apr 26 12:41pm, Apr 26 2:14pm, Apr 27 7:47pm and Apr 29 sometime before 7:54am EDT. Sadly, the two youngest chicks passed away late afternoon May 16 and the evening of May 17. In a public vote, the two remaining chicks were named Azure and Woodstock. Nest 2 & 3 have brooding Moms, too, but we cannot see how many eggs they have nor whether they have hatched. We patiently wait for bobbing heads above the nest rails. The summer heron cam season went smoothly, Woodstock fledged June 30, Azure fledged July 7. Rell and Eddie had four chicks – one sadly did not make it. The nest grew to be quite crowded with 3 very large chicks and their parents. In February 2016, a private homeowner contacted the Chesapeake Conservancy expressing an interest in sharing the rookery located on their property with the world via a webcam. For the last ten years, the property has been home to between 10 and 12 nests, and as many as 50 herons, 100 feet off the ground in loblolly pine trees. The Chesapeake Conservancy launched an online crowdfunding campaign to finance the new cam. Between crowdfunding and a generous sponsorship by Waterfowl Chesapeake, the Chesapeake Conservancy raised $10,000 and launched the new cam on April 4, 2016. The Chesapeake Conservancy was thrilled with this chance to share these majestic birds with the public. We often see great blue heron soaring in the sky or hunting fish by the water’s edge, but rarely do we get to see them up close and at home in their rookery. We are also very grateful to the homeowner who is lucky enough to have this magnificent habitat in their backyard and is willing to share it with the world. The homeowner chose to name the couple “Rell & Eddie” after the surfers Rell Sunn and Eddie Aikau. On April 23, 2016, their three eggs hatched. After a public vote, Rell and Eddie’s chicks were named Felix, Lafayette and Moe. 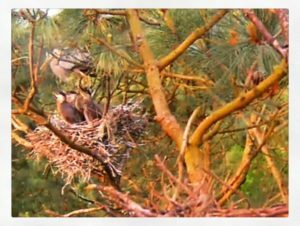 Great Blue Heron cam features a wider-angle view to capture activity from multiple nests, as well as infrared night vision to see in darkness. During the 2016 season, two nests could be seen on the camera. One was home to two herons who alternated incubation of their eggs. We’re very grateful to the more than 125 individuals who donated to the GoFundMe campaign, the more than 800 individuals who shared it and helped get the word out, and to Waterfowl Chesapeake for their very generous co-sponsorship. The cam is powered by Mediacom, who donated equipment and Internet services for the live-stream. Skyline Technology Solutions, Inc., based in Glen Burnie, MD, provided a discounted installation rate and equipment. Skyline also supports the Chesapeake Conservancy’s osprey and peregrine falcon cams. Axis Communications also provided discounted equipment. Generously, a tree company based in Rehoboth, DE, donated their services to mount the cam in the 100-foot-tall pine. According to the Chesapeake Bay Program’s website, great blue herons live in colonies called rookeries. These tall, bluish-gray wading birds have long, pointed bills and graceful, S-shaped necks. They live year-round in marshes and wetlands throughout the Chesapeake Bay region and are also found on freshwater lakes, ponds and impoundments. The great blue heron grows to 4 feet tall with a 6 to 7 foot wingspan. Despite its large size, its hollow bones allow it to weigh only 5 to 6 pounds. The great blue heron eats mostly fish, but will also feed on insects, amphibians, crustaceans and other small animals. It silently stalks its prey in shallow waters, and then plunges its bill into the water to capture it. It will spend about 90 percent of its waking hours hunting for food. Learn more about the great blue heron with our frequently asked questions and fun facts. To learn more about the Bay’s other amazing creatures use our National Wildlife Refuge App, or visit one of our region’s many national and state parks and refuges to see them in the wild! If you enjoy our Great Blue Heron Cam, please consider donating to the Chesapeake Conservancy to help us in our efforts to protect their Chesapeake habitat.